We believe it is a mistake to equate the digital-economy development needs and implications of Latin America (and other developing countries) with those of developed economies. These differences are not only based on the purchasepower gaps that every businessperson is aware of, but also how all market forces differ in the two regions. Considering these important demographic, connectivity and requirement gaps between the economies, we explain how companies and governments in developing economies need to pursue a specific approach to ensure development of adequate digital economies. Governments have an important challenge to promote acceptance of new technologies and ease of digital adoption by populations and companies. Some of the recommended actions are energizing digital acceptance with holistic digital public policies, measuring the digital impact in economies and promoting digital telecommunications infrastructure, redefining traditional regulatory framework and institutions, fostering digital and banking penetration, and understanding the implications of each new business model in order to quickly react. Management should engage the organization with a digital culture and vision that integrates market and operational advantages, continuously push better digital interaction tools with customers and stakeholders, ensure digital trust, and accelerate the adoption of new and mature technologies. Closing the digital gap will require effective coordination between regulators and companies, which today seems to be a major challenge. 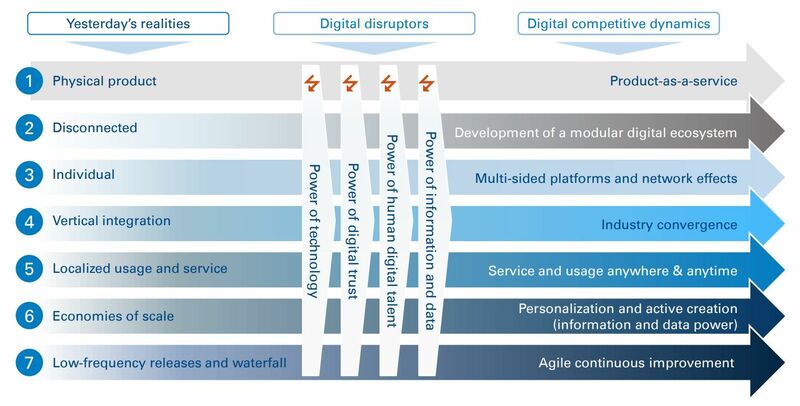 From both a personal and a business perspective, digitalization has common ground across different geographies. Millennials, considered the first global generation, have a broader range of commonalities than previous generations – access to similar hardware and media or usage of similar apps and tools. Furthermore, digital disruptors and competitive dynamics influencing the economy are very similar across geographies. We might assume that all millennials have similar digital expectations regardless of their country or culture, and the approach to marketing to them should be the same globally. However, as we go deeper with infrastructure, sociodemographic traits, requirements by users and business and competitive dynamics, there are considerable differences in the needs for digital transformation among developing economies in Latin America versus developed nations. The applicability of these digital trends varies by industry and the digital maturity of the country. In terms of the mobile industry as the driver for service anywhere and anytime, specific gaps between Latin America and developed countries have to be considered. As regards mobile subscription penetration, there are similar behaviors, with 110–113 subscriptions per 100 inhabitants, but typologies differ heavily. Voice is still the value driver for Latin American mobile users, representing 60 percent of their subscription costs and leaving the remaining 40 percent for data packages. Comparing this data share to the 55 percent average spend per subscription in developed countries, it is reasonable to assume that there are major differences between mobile phone users in these markets. one-fifth compared to developed regions. In terms of internetusage penetration, Latin America ranks far lower than developed countries. According to the World Bank, only 54.5 percent of Latin American citizens use the internet on a regular basis, compared to 84 percent in developed economies. Furthermore, this gap is more dramatic if we take into account the segment of the 60+-year-old population, for which Internet adoption is only 11 percent in Latin America, versus 25 percent in developed countries. Additionally, the quality of connectivity differs from one market to another. Despite the mass-market deployment of 4G mobile technologies, fixed broadband, as the main option to ensure high-quality and unrestricted traffic connectivity, has different penetration. As an example, there are 39 connections per inhabitant in developed countries, versus only 10.5 in Latin America. This is forcing a major share of the Latin American population to connect via mobile broadband with coverage, spectrum saturation and traffic restrictions. In terms of sociodemographic traits and user requirements, millennials (accounting for 41 percent of the population in Latin America, versus 31 percent in developed countries) are not that similar. The main differences are due to less access to digital electronics – which are considered a luxury product and more vulnerable to theft – less trust in digital transactions, and lower internet penetration. Low digital trust affects the development of the sharing economy and digital financial services. Based on these demand requirements, the digital supply is lacking the mainstream presence of online consumer advocacy groups, price-comparison platforms and brand investigative sites seen in developed economies. Regarding digital penetration in the small and medium-sized enterprises (SME) segment, the perspectives are also very different, as developed economies have increased usage and adoption compared to developing ones. In Mexico, for instance, only 10 percent of SMEs have online sales, even though they represent 72 percent of employment and above 50 percent of GDP2 . This is small penetration compared to the 20 percent of EU-28 SMEs with online presence. Lastly, public opinion’s main areas of concern are different. According to the European Commission’s Eurobarometer, the main areas of concern for Europeans are immigration, unemployment, public finance of member states, and terrorism, while Latin Americans are concerned about labor and economic stability, social and gender inequality, corruption and crime.